Spring has sprung in the south, once again. The bees are buzzing; the flowers are blooming. With just a few hours of outdoor playing, my antsy and irritable winter children have magically transformed into excited little spring butterflies. The moment they are done with school, my kids race outside eager to explore and play. Each evening they come inside with their pockets bulging, full of rocks, flowers, bugs, and other springtime treasures. With all of the time my children are spending outside, I thought it would be wonderful for them to have a spot to keep their treasures and plan their next adventure. 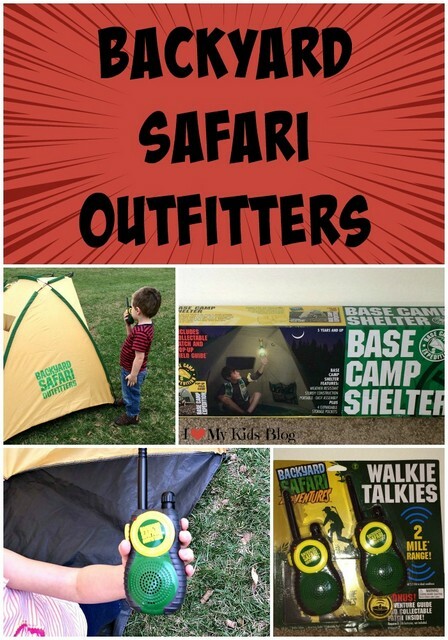 The Alex Brand Backyard Safari Outfitters Base Camp Shelter is the perfect place for my children to play, plan, rest, and store their important collections. The Base Camp Shelter is made of a durable, lightweight fabric that mimics actual tent material, and the floor of the shelter contains a moisture-proof floor lining. 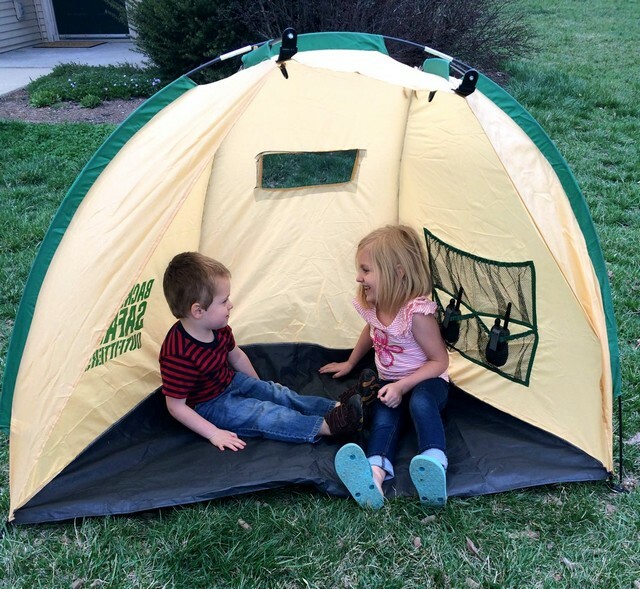 The Base Camp Shelter is 40” in height and is the perfect size for several children to play and plan. The shelter features a rear-window that is perfect for keeping a lookout! The shelter also has d-rings and four cargo net storage pouches that are handy for storing any necessary exploring supplies and water bottles to keep themselves hydrated. The Base Camp Shelter was simple to assemble, and was very similar to typical tent assembly. The three poles were easy to connect, and then we slipped them into the fabric covers. The entire shelter was assembled in less than five minutes. 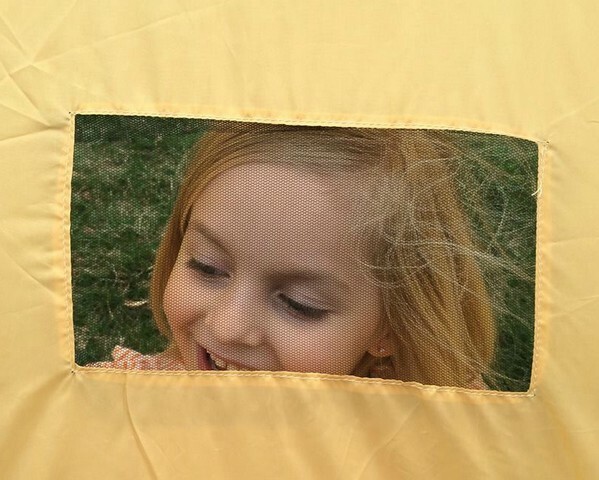 Once the shelter was assembled my kids loved hiding, running, and playing in it. Pretty soon the cargo storage pockets were full of rocks and dandelions. The Base Camp Shelter also creates a perfect shaded area. When my kids are playing outside for an extended time, I’m glad they will have a great place to cool down and get out of the sun. At the base of the shelter, there are small hooks that can be staked to the ground (stakes not included). I would highly recommend using stakes. As my kids were running in and out, the shelter would shift and travel. 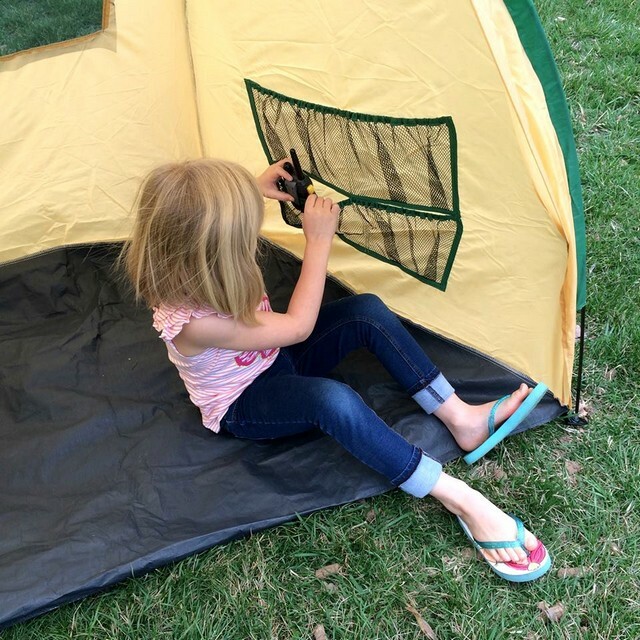 The Base Camp Shelter comes with a pop-up field guide, storage pouch, and an iron-on patch for your little explorer. It retails for $35.33, is recommended for children 5+ and is available at Walmart. 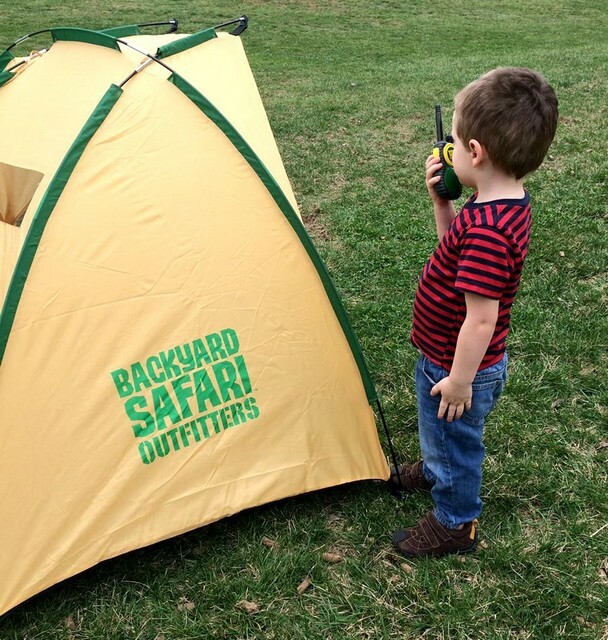 Backyard Safari Outfitters has created the perfect set of walkie talkies. They are lightweight and the perfect size for small hands. 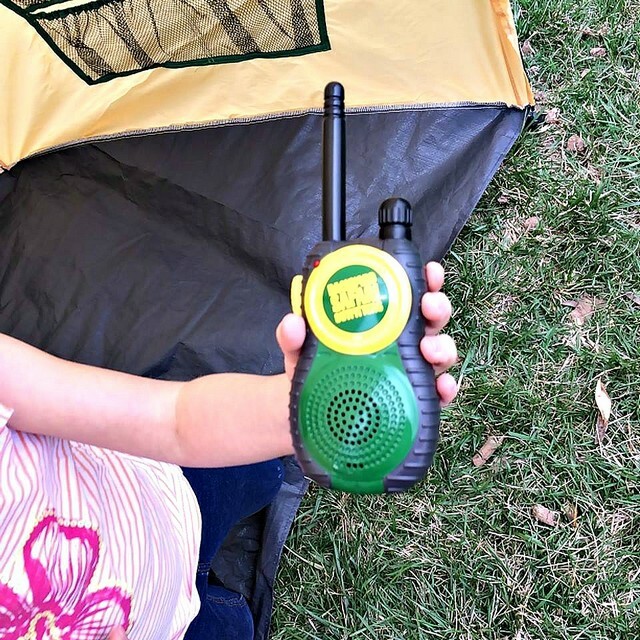 With an antenna range of two miles, they are just right for your little backyard explorer. My children were able to roam all around the backyard and still communicate. Your child simply has to push the yellow button on the side to contact their fellow adventurer. 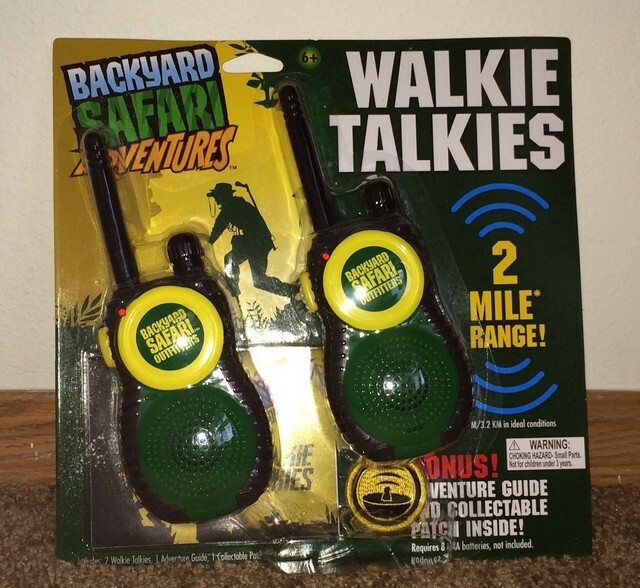 The Backyard Safari Walkie Talkies use an easy turn power and volume knob, that is easy for children to control. A red LED indicator, lets your explorer know if the walkie talkies are powered on.